Gleaves Whitney is the director of Grand Valley State University’s Hauenstein Center for Presidential Studies. During his tenure, he has been the architect of more than 400 public programs, including four national conferences covered by C-SPAN and four internationally webcast debates—one to more than 3,500 viewers in 18 countries, and another watched on YouTube by nearly two million people in some 30 nations on all six inhabited continents. He’s also premiered a popular web column called Ask Gleaves—the first presidential Q & A column in the nation—and created a leadership academy for students and young professionals committed to public service. Under his direction, the Hauenstein Center’s Peter C. Cook Leadership Academy has emerged as a preeminent center of leadership excellence in the Midwest. Cook Leadership Fellows have been face-to-face with four U.S. presidents, three first ladies, two vice presidents, four secretaries of state, six state governors, numerous business and nonprofit executives, multiple Pulitzer Prize-winning writers, the world’s most decorated academic, a Grammy Award winner, and a national championship basketball coach. 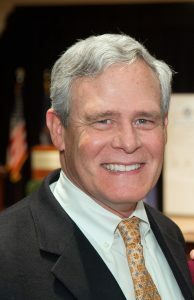 Prior to his arrival at Grand Valley, Gleaves worked eleven years in Michigan Governor John Engler’s administration, serving as senior writer, chief speechwriter, and historian. In 1993, the Governor assigned him to a task force that helped bring sweeping education and school finance reforms to Michigan that the New York Times called “the most dramatic in the nation.” In 2001 he helped the Governor establish Michigan’s Department of History, Arts, and Libraries. In addition to his public-sector service and work, Gleaves is a scholar who writes and lectures nationally on a variety of historical topics. He is author or editor of 15 books including most recently To Heal a Nation: The Story of Gerald R. Ford, and (with Mark Rozell) Testing the Limits: George W. Bush and the Imperial Presidency. Other books include Religion and the Presidency (with Mark Rozell), Religion and the Bush Presidency (also with Mark Rozell), American Presidents: Farewell Addresses to the Nation, 1796-2001; John Engler: The Man, the Leader & the Legacy; and 6 volumes of Messages of the Governors of Michigan. In 2011 he partnered with M. W. Grass Strategic Communications and Meijer Inc. President Hendrik Meijer to produce a two-hour documentary on Michigan’s famous senator, Arthur Vandenberg, broadcast on PBS in December of that year. Several of his talks have appeared on C-SPAN; his commentary has appeared in numerous newspapers, magazines, and journals; and he has been interviewed by, among others, The New York Times, CNN, MSNBC, ABC, FOX News, Newsweek, US News & World Report, and NPR and its affiliates. Gleaves graduated with honors from Colorado State University (1980), was elected into the Phi Beta Kappa honor society (1980), and was a Fulbright scholar to then-West Germany (1984-85). His master’s degree and doctoral candidacy were at the University of Michigan, Ann Arbor, where he was a Richard M. Weaver fellow (1987-88) and an H. B. Earhart Fellow (1988-91). He has taught at the University of Michigan, Colorado State University, Droste-Hülshof Gymnasium, Aquinas College, and Grand Valley State University. In 2006, he received the honorary Doctor of Humane Letters from the Graduate Theological Union’s Dominican School of Philosophy and Theology in Berkeley, California. Gleaves was born and raised in Houston, Texas, and now makes his home in Grand Rapids, Michigan, with his wife, Mary Eilleen.